Eight Welsh Labour MPs voted against the bill which will allow ministers to trigger Article 50 and leave the European Union. In total, 52 Labour MPs voted against the bill at the third reading - five more than those who voted against it at second reading last week - but it went through by 494 votes to 122. Wednesday's vote was the last stage before it goes to the House of Lords. Prime Minister Theresa May wants formal Brexit talks by the end of March. 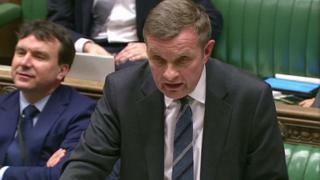 Ceredigion Liberal Democrat MP Mark Williams, who voted against the bill, said: "Tonight MPs had the chance to amend the Tory Brexit bill to ensure that the British people had the final say on the terms of the deal at the end of the government's negotiating process. "Instead we saw MPs vote to give the government a blank cheque to pursue the most damaging Brexit possible." The Labour MPs who voted against the bill included Swansea West MP Geraint Davies, who did not vote last week. The other MPs were: Kevin Brennan, Chris Bryant, Ann Clwyd, Stephen Doughty, Madeleine Moon, Owen Smith and Jo Stevens. Labour leader Jeremy Corbyn said he understood the difficulties the vote presented some of his MPs but said they had been ordered to back the Article 50 because the party would not "block Brexit". All three Plaid Cymru MPs voted against the bill. Plaid Cymru's Brexit spokesperson Jonathan Edwards, MP for Carmarthen East and Dinefwr, said the party would "continue to fight tooth and nail for Wales' interests as the bill moves through the House of Lords". Brexit Secretary David Davis hailed the "historic vote", adding: "It is now time for everyone, whichever way they voted in the referendum, to unite to make a success of the important task at hand for our country."